Nigel Henderson recants the moment that AFC Wimbledon completed their remarkable rise up the non league ladder. On Saturday evening, about 20 minutes before the world was due to end according to a well-publicised American preacher, I lifted my eyes up to the greying sky above the City of Manchester Stadium and asked the Man Upstairs for one last favour. As Danny Kedwell, the AFC Wimbledon captain, lined up the final of his team’s five penalties – one that would, should he score, clinch a “return” to the Football League for a club at least moulded in the Dons’ image, I realised that I wanted this more than anything. More than world peace, more than a successful and contented professional life, more even than dinner with Jennifer Aniston and whatever might follow over coffee at her Hollywood mansion – and even if it did mean eternal damnation. Kedwell did the job – as you knew the 25-goal striker just might – smashing the ball to the right of Mark Tyler, the Luton goalkeeper – and set off on a sprint of delight in front of the seating where the bulk of his team’s fans were massed. If the promised Rapture was not about to arrive for the world’s faithful, it had certainly arrived for the Wimbledon one. This morning was supposed to be all about Maidstone United…They were playing Histon in the FA Trophy in potentially their biggest game in their history…but the rain started falling and at 2pm the game was off. With no time to implement plan B I had to endure a shopping trip and Radio 5Live as one of the most predictable results of the season filtered through my head (Birmingham City 1 West Ham United 0, scorer Lee Bowyer @ 40-1). Very disappointing indeed as I had travelled back from my Christmas party and awards ceremony in Copenhagen still wearing by black tie for the occasion. So not wanting to leave you all hanging, and still finishing off a couple of other blog posts I thought I would do a quick update on a couple of our featured teams this season from the blog..
Our friends from the south of Copenhagen’s season didn’t improve much from when we was there two months ago (see here for our trip). After their home defeat to the mighty FC Copenhagen in October they drew two and lost four games, leaving them in bottom place with 8 points at the Christmas break. However, their defensive issues have been sorted and each game as been close with all four defeats being by a single goal. But there is a bit of good news on the horizon. Due to a fortunate draw they do have a chance of glory still in the Ekstra Danish Cup. A couple of wins against lower league teams have put them into the quarter-finals where they will be playing OB in April. With Brondby and FCK out, they are only two wins off a spot in the Europa League. Our other featured Danish team continues to impress though. As well as making it through to the quarter finals of the cup they went into the long winter break still top of the league, leading FCK by a single point. With Roy Carroll still inspiring them in goal and Peter Utaka heading the scoring charts in the league, Fionia Park is not a place many teams want to visit. We did, back in October and we loved it! Since then the club have won four and drawn two goals, but did lose their last game before the break to FCK. Interesting times in the second half of the season we think. When we were in Dublin for their game against Drogheda United, Bo’s trailed Shamrock Rovers by a couple of points having just lost to them. After the game lady luck played her hand, and whilst Shamrock faltered, Bo’s form was top draw, winning four and drawing one game to take the title by four points. 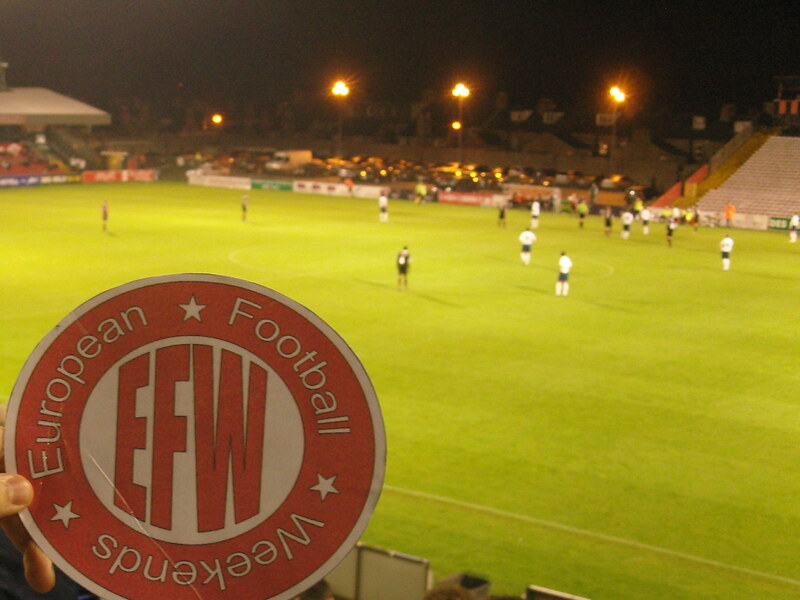 Our friends from Drogheda also found some form in the end and stayed up as Bray were relegated. Played 17 lost 17 was the story last month for Durham City in the Northern (Unibond) First Division. It is now played 20 lost 20 and the team followed up their 11-0 defeat to the now (defunct) Kings Lynn, with a 7-0, a 7-1 and a 4-0 defeat. However, they did run Frickley Athletic close with a 3-2 two weeks ago. The players continue to play with spirit and professionalism that is earning them praise from all querters. Despite exiting the FA Cup in the qualifying stages, the team from north London continues its journey to Wembley on another front as they are now in the last 32 of the FA Vase where they will host Daventry Town in January. And finally, we covered some of the bigger teams in our domestic leagues. West Ham United is a constant source of jokes and we are almost certain to go into Christmas in the relegation zone and with Dean Ashton, our great white hope having announced his retirement from the game. Lewes FC go from strength to strength on and off the pitch. 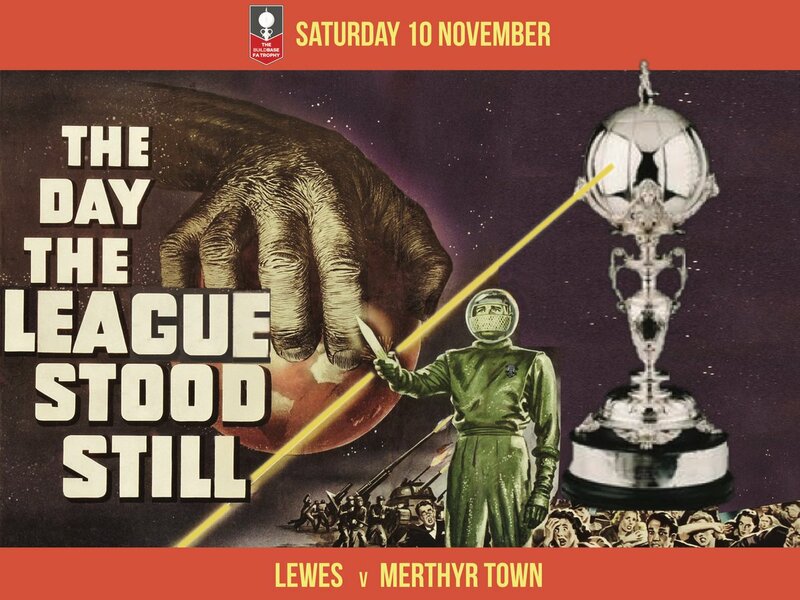 Another fine performance away in the FA Trophy to Hampton & Richmond sees them in the draw (albeit with a replay) for the 2nd round and one defeat in seven has seen the team start to climb the table with the tax man once again satisfied with the financial situation. Luton Town continue to flounder after the sacking of Big Mick Harford back in September and despite still being in the FA Cup, they are outside the playoff zone in the Blue Square Premier and out of the FA Trophy. So there we have it – a quick fill in post thanks to the weather! “The game today is different from my day. I don’t really miss much although I wouldn’t say no to the £60,000 a week” – Mick Harford. So dear readers, those of you who can think back 4 weeks will remember that I ventured down to Swansea to complete ground 91 out of 92 to try and “restore” my membership criteria for the now defunct 92 Club. The sole ground left to be visited is also one of the most remote for me sitting at home in the Garden of England – Morecambe. And what better time to visit one of England’s most traditional seaside resorts than during a wet winter weekend. Well it is supposed to be the middle of spring, and certainly last weekend we saw some spring-like temperatures but in the meantime I had endured heavy snow in Copenhagen and a flood in London – global warming pah! The game fitted nicely into my agenda very well. Firstly it was an International weekend and so the Hammers did not have a game. Secondly I gave up my chance to watch England play an absolute meaningless friendly against Slovakia (even the almost disabled Ledley King withdrew from the squad for this one). Thirdly Morecambe were playing Luton, Football Jo’s other beloved team and finally I could take CMF and the Little Fuller’s along for a night in a Premier Inn and a day at Alton Towers. This was going to be a long drive. Approximately 270 miles each way…in a car of four women. Two of which will be talking about Jade Goody and two of which will be talking about more intelligent things but still complete rubbish. I don’t know how I agreed to drive but I must have been evil somewhere in the past few weeks to deserve this treat. But drive I did to the home of one Eric Morecambe. How convenient that a famous comedian was named after the town he came from..well he was actually born Jon Eric Bartholomew and took his stage name from the town where he was born. He is today immortalised in bronze (well sort of melted tin cans) in a comical pose on the seafront. What made it all more relevant is that Morecambe actually lived most of his life in Harpenden, the start of our journey, and was a die hard Luton Town fan. So what better way to celebrate his life than a homage to his home town. This was going to be an important game for a number of reasons. Firstly Luton Town, the visitors were on a bit of a roll. The deficit to safety was nearly down to single figures, and with the hope of one of the teams at the bottom going into Administration before the end of the season, all was not lost. They had also made it through to Wembley for the Johnstone Paint Trophy final, and in the process had broken the record of the most tickets sold for a club game at the new stadium by one single team. Secondly it would see the debut of Lolly Leaf as a match reporter. Yes, I had agreed to give up the pen for the reporting on the match itself. All part of a project for school I hasten to add rather than my early retirement. So some of what you read below is the musings of an eight year old who still doesn’t quite get the concept of corners, let alone the passive offside rule – sounds a bit like Stuaty Attwell then! Morecambe have been in the league for the past two seasons, after winning the Conference playoff final against Exeter City in May 2007 under the leadership of Sammy McIlroy. Last season they started with a bang, winning 2-1 at Preston North End in the Carling Cup in just their second game as a league team, following it up with a win over Wolves two weeks later. They finished the season on 60 points and eleven place, and they came into this game in the same place, although they should finish on more points. More importantly they were on a very impressive twelve match unbeaten run. The club had been knocking on the door of league football for quite a while. They played for ten consecutive years in the top flight of non-league football, finishing runners up in 2003 before reaching the play off final in 2007. 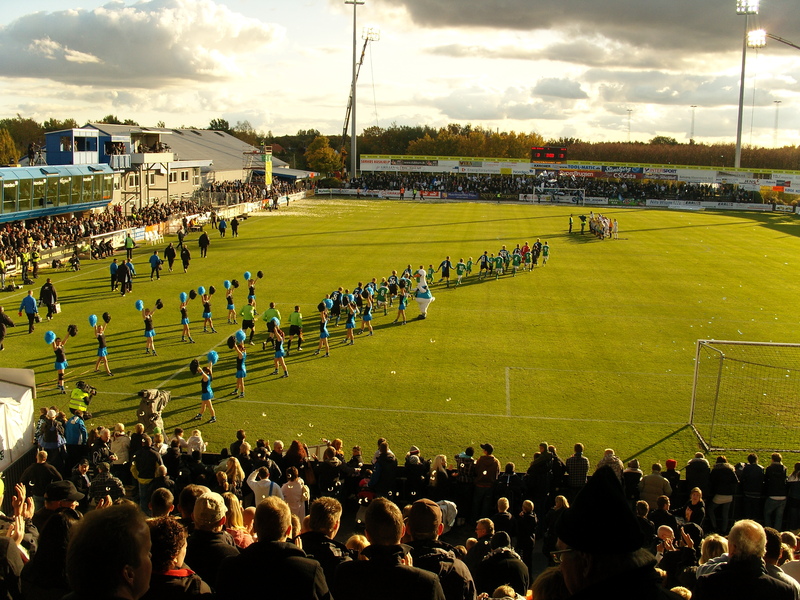 This period game them the time to get the investment in place to expand the intimate Christie Park stadium to comply with the Football League criteria, although it may not be around for much longer as plans are now at an advanced stage for the construction of a new stadium in the town centre, pencilled in to be ready for the 2010/11 season. We arrived around lunchtime, parking next to the Eric Morecambe statue that had been dressed in a Luton Town strip, and the Luton Prayer attached to it. We wanted to find some authentic fish and chips but could only see down at heel pubs and pound shops. So much for a classy English resort town. However, after a bit of digging around the side streets we did find one and settled down for the most British of traditions, with gravy on everything. The weather was bracing to say the least but it didn’t stop us having a run around on the beach. Even the brave Bedfordshire soles stayed in the pub rather than try a Reggie Perrin and dash into the tide. On the far side of the bay you could make out some of the edge of the snow capped Lake District and the topography had been made into a 3D picture on the promenade which proved hours of fun for the more grown up females in our party in making rude words (see pictures below). Infants! CMF wasn’t brave enough to take Littlest Fuller so they went off to do some shopping while Football Jo, Lolly and myself headed to the ground, picked up our tickets and took our seats in the stand. And what a strange structure the main stand was. It ran from penalty area to penalty area and was raised above pitch level with the side double glazed in. This meant that from where we were sitting some 4 rows back we could not see the goal at one end or any of the near touch line. God knows what sort of view the people had at the back! The Luton turnout was impressive. On the way up we had estimated about 300 would make the trip but there appeared to be at least double that, hoping not only to upset the form book here but also hoping for results to go in their favour elsewhere. What was noticable from kick off was the size of the Morecambe team. Two of the back four could quite easily play in the front row of the scrum, and with the slightly built Kevin Gallen leading the line it looked like it might be a difficult afternoon for the Hatters. The strong wind did not help matters as Morecambe used it to their advantage to put the visitors under pressure from the off. Luton simply could not get hold of the ball in midfield and it was no surprise when Morecambe took the lead in the 21st minute from a set piece. The assistant referee managed to see a foul that nobody else in the ground saw on the touchline and from the resulting free kick Stewart Drummond headed home, outjumping two Luton defenders. Queue one Luton fan in the seats starting a rant at Chris Martin, although how he could blame him for a challenge that was neither illegal or dangerous I do not know. Luton then started to come back in the game. Captain Nicholls made his presence felt in the midfield with a number of crunching tackles, and for once we had a referee who was happy for a full bloodied game without the constant whistling. The Hatters thought they had equalised on 30 minutes as Asa Hall powered home a header from a corner but the whistle had already gone, and a few minutes later a shot dribbled agonisingly along the Morecambe goal line after a fine save from their keeper. It seemed as if their luck had stayed at home, until the 43rd minute when Chris Martin stooped low in the penalty box to head home, through the keepers legs, from a great cross in from the left. Our fan who had abused Martin a few minutes earlier all of a sudden jumped to his feet to celebrate, ignoring the cat cats from around him about his fickleness. Luton started the second half with purpose and although Dean Brill in goal had the fans hearts in his mouth a few times with his handling the final score was never in doubt. Luton simply wanted the game more than Morecambe. Craddock became more influential and should have scored a couple himself, but it was left to veteran striker Kevin Gallen to score the winner after the Morecambe defence had stopped to appeal for an offside flag. The fans, many in their Eric Morecambe coats, wigs and glasses went wild and some jumped the advertising hordings, but sensible policing saw that this was not taken any further and calm was restored. Apart from a few hairy moments when Brill was called into action near the end, and Craddock getting one of the most pointless bookings in the world for hoofing the ball out of the ground some 5 seconds after the whistle for an offside decision had been made it was plain sailing for the Hatters. A vital three points, and although the other results didn’t all go their way, it was a step nearer safety. 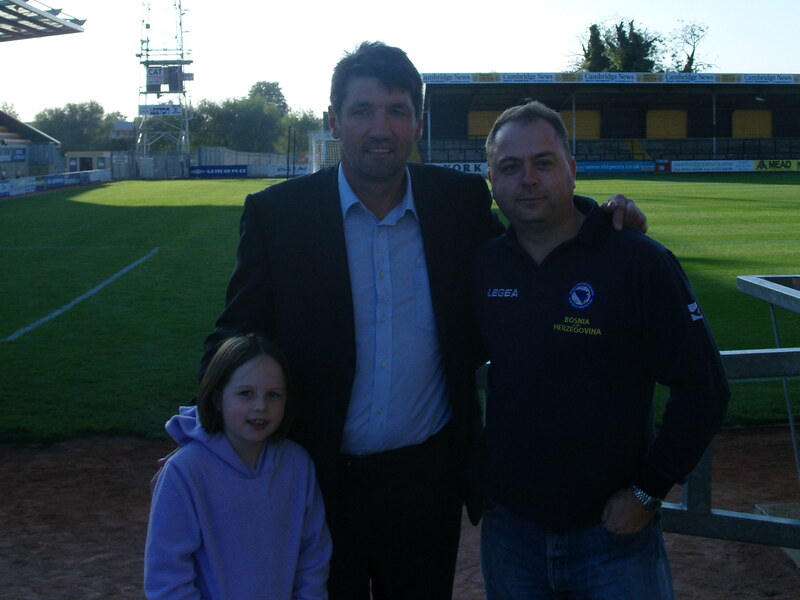 We waited around after the game for a word with Mick Harford who was pleased with the day’s work. Lolly thought she would ask him if he wanted to come to Alton Towers on Sunday – we could see a flicker of interest in his eyes but being the consumate professional he declined. So roll on Wembley for Luton next weekend, although a midweek game versus Rotherham United would be the focus of all their attention prior to that. We headed off to Lancaster for the night, before a day at Alton Towers beckoned. It had been a long old day but very enjoyable. We certainly hadn’t brought any sunshine but we left with three points. Christie Park could never be described as an attractive lower league ground but it is more than functional for the club at this level. On one side of the ground is the Main Stand, which is a classic old looking stand. It runs in length for around half the size of the pitch and straddles the half way line. It is a covered stand, with a seating area which is elevated above pitch level, so that spectators need to climb a set of stairs to enter the stand. On each side of the stand there is a windshield, to help protect fans from the sea breeze. However this can block the view of the goals for those seated at the back. Also the seats are not the most comfortable in the world, having no back and made of metal. The stand is slightly setback from the pitch and hence there is a small terrace area in front of the seated area. The only disappointment is that there are a couple of modern looking floodlight pylons which are situated directly in front of the stand at the side of the pitch. Opposite is a very small uncovered terrace, which is only a few steps high. This area is known affectionately as the ‘car wash terrace’, as it is the only uncovered area of the ground and has a car wash situated behind it. Again has a set of four floodlights located along the front of it. At one end is the impressive looking North Stand. This good sized terrace is covered and has windshields to either side. Opposite is the smaller Umbro Stand, also a covered terrace with several supporting pillars in front. The ground is also used for Blackburn Rovers reserve games. The Club has announced their intention to leave Christie Park and move to a new stadium in the Westgate area of Morecambe. The new stadium will have a capacity of 6,000. If things go to plan then the Club could be kicking off in their new home for the start of the 2010/11 season. 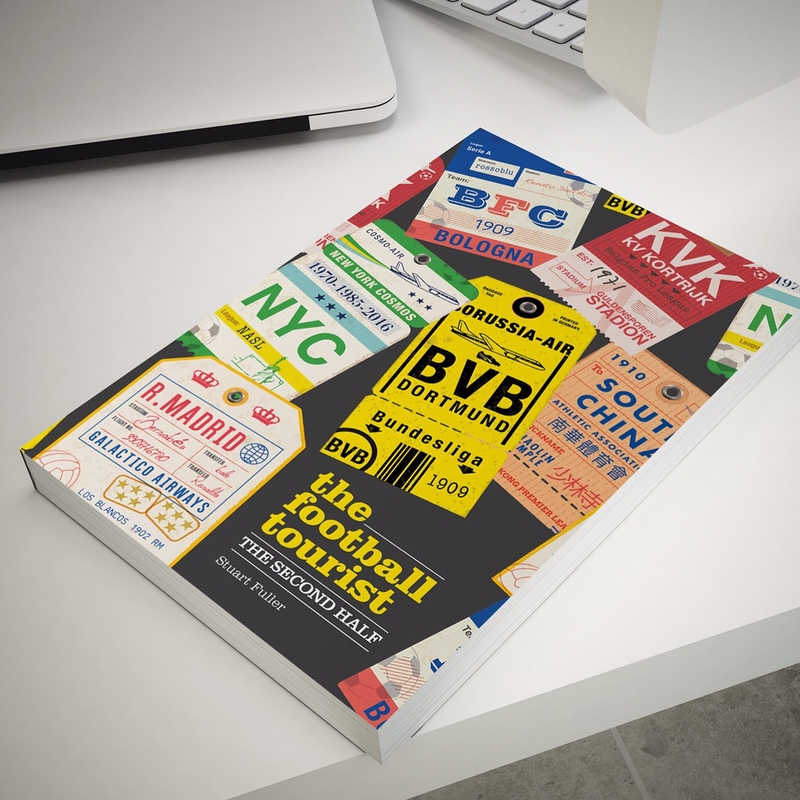 Many thanks to Duncan Adams and his website http://www.footballgroundguide.co.uk for the bulk of the information above. If you are coming by car then you will undoubtably come via the M6 from all directions. Exit at junction 34, and take the A683 towards Lancaster and then the A589 towards Morecambe along the side of the River Lune. Go straight across two roundabouts passing a McDonalds your left. At the next roundabout take the second exit into Lancaster Road which is signposted Town Centre. The ground is a few hundred yards on your left. The main car park is for pass holders only. However there is another small car park behind the Umbro Stand which is free and normally reserved for away fans. There is plenty of free street parking as well. The station is about a 20 minute walk away from the ground or 5 minutes in a taxi. As you come out of the station turn right down Central Drive and then alongside Euston Road. This leads into Lancaster Road where the ground is located. Morecambe is served by trains from Lancaster. With an average gate of less than 2,500 and a capacity of more than double than at Christie Park sell out’s are unheard of. Ticket prices are £15 for a place in the Main Stand, but unless you sit in the middle your view will be obstructed, or £13 behind the goals in the covered stands. For a place on the open Car Wash Terrace it is £12. Under 16’s start from £4.